"Home of the LMC Agitated Bay Composting System"
Welcome to Longwood Manufacturing Corporation! The most versatile, reliable, cost-effective, totally-enclosed composting systems available today. Founded in 1969 as an equipment repair shop, Longwood Manufacturing Corporation has developed into a premier manufacturer in the fields of heavy metal fabrication, machining and special-application machinery. 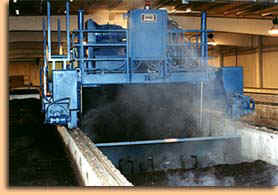 In 1972, LMC began manufacturing equipment for composting organic materials. And, in 1986, LMC became the first American manufacturer of Agitated Bay Composting Systems for the processing of organic waste materials. These totally-enclosed, computer-controlled systems are cost-effective, reliable and environmentally friendly.